Pleasant Grove center averaged 17 points, nine rebounds and five blocks as a junior. Matt Van Komen's first scholarship offer came as he prepared to rebound a free throw. Utah coach Larry Krystkowiak called out to him during a summer basketball game in Las Vegas, prior to the 7-foot-3 center's sophomore year at Pleasant Grove High School. Van Komen never forgot that gesture, having cited it as the first moment he thought playing college basketball was a possibility. He followed through Sunday, committing to play for the Utes. Gonzaga was thought to be another top contender for Van Komen, having offered him a scholarship last summer. He chose Utah, where he will join Olympus point guard Rylan Jones, another star of the state's class of 2019. Pleasant Grove, the Class 6A state runner-up last March, will visit 5A defending champion Olympus on Nov. 27. (Leah Hogsten | The Salt Lake Tribune) Lone Peak's Steven Ashworth (03) slips past Pleasant Grove's Matt Van Komen (22). Pleasant Grove plays Lone Peak to win the 6A High School BoysÕ Basketball Tournament Championship at the Jon M. Huntsman Center in Salt Lake City, Saturday, March 3, 2018. The Vikings have booked several other marquee games in 2018-19, with Van Komen as their big attraction. Pleasant Grove will play in four-day tournaments in Illinois and Hawaii and a one-day event in California. Van Komen averaged 17 points, nine rebounds and five blocked shots as a junior, continuing his steady development in his second season as PG's starting center. He was named to the All-Tribune statewide team after the Vikings lost to Lone Peak in the state title game. “He’s made significant improvements and added things to his game,” Pleasant Grove coach Randy McAllister said. Krystkowiak and his staff are hoping Van Komen’s growth as a player will continue during his four or five years in the program. The relationship with Krystkowiak was the deciding factor in his commitment, his father said. 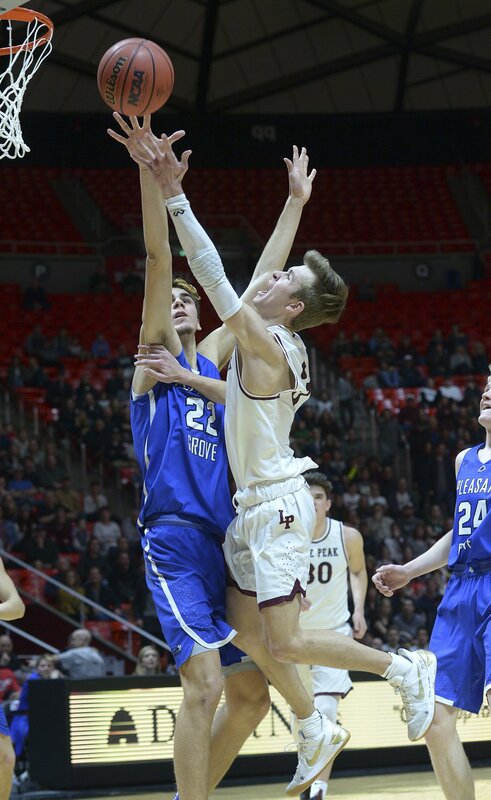 Van Komen’s commitment followed the recent decision of point guard Mason Falslev, a Sky View High School junior, to join Utah’s program.